Wall Stencils, Stencil designs, New Stencil Patterns by Cutting Edge Stencils. Here are some of our latest Stencil Designs! We hope you enjoy our new stencil designs as much as we do. At Cutting Edge Stencils creativity never stops. 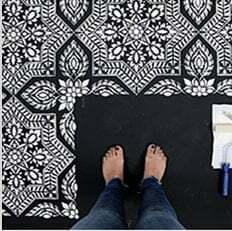 We are constantly on the lookout for new trendy stencil patterns, and there is always something exciting on the drawing board: new wall stencils, tile stencils and mandala stencils. Feel free to contact us and send us your stencil suggestions: we would love to hear from you and consider your ideas for our future stencil designs. Don't forget to send us pictures of your finished stenciled projects, so we can share your DIY masterpiece with our 165K Facebook fans! For those of you who are new to stenciling: Please watch our How To Stencil Videos to learn a simple stenciling technique. Stencil is the best tool for DIY decorators: easy, versatile and economical. Have fun and create your own unique personal space with our reusable stencils! ~ Janna and Greg, creative directors, professional decorative painters and stencil artists of Cutting Edge Stencils.